Prepare every dish like a professional with these stylish induction pans from Bosch. These 4 pans are specially designed to work with your induction hob, so you’ll have fast and responsive cooking with every dish. 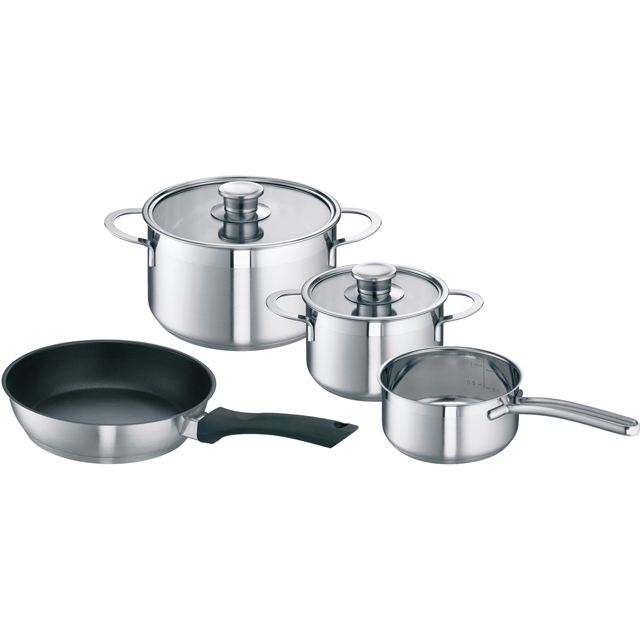 This set includes a 16cm saucepan, a 16cm stock pot, 22cm stock pot and 24cm frying pan, which means you’ll have the perfect size to prepare anything from light lunches to hearty casseroles. The large stock pot can be used in the oven too, as it can withstand temperatures up to 180°C with the glass lid on, and up to 220°C without it. Cleaning up after mealtimes is totally effortless as well, as these pans are all dishwasher safe. They even come with a 2 year manufacturer warranty.